A principal attraction at the Chesapeake Bay Maritime Museum is the 1879 Hooper Strait lighthouse. Before it was built, vessels navigating Hooper Strait were guided by an earlier lighthouse and by lightships of 1827 and 1845. 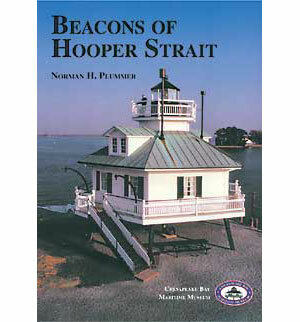 This book looks at the history of these beacons and at the men who served them in storms and calm. It is based on extensive research in federal records from the administration of John Quincy Adams through 1966 when the last lighthouse was removed. Norman Plummer has previously written two books on maritime history and a number of articles for the Chesapeake Bay Maritime Museum's magazine, The Weather Gauge.